Drink about a gallon of water daily (128 oz. – 168 oz.). The minimum you should be consuming is half your body weight, i.e. 200 lbs = 100 ounces of water, not coffee, soda, juices or tea. Eat the heavy foods in the morning before noon. Start your day with your largest meal, as the day goes on cut back on your carbohydrates, at midday your meal should be medium, and your last meal should be small, consisting mostly of Protein and Vegetables. Your eating plan should be low in sugar and sodium (salt). It is important to eat on a regular schedule to keep your metabolism moving rapidly. The average person is awake 18 hours a day, and should be eating every 3 hours (5 meals a day each consisting between 300 - 500 calories); last two meals should be mostly protein and veggies only. Eat plenty of raw veggies, fiber is good for attracting fat and keeping your colon clean. If you have lived on a high bread diet most of your life and tend to retain water consider doing the Yeast Free Diet for a month or two. Make sure you eat enough protein to rebuild your muscle tissue. 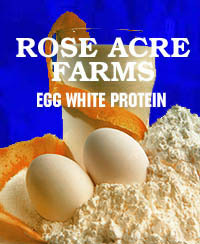 Consider adding proteins shakes in between meals, www.RoseAcreFarms.com carries an “all egg white protein” with no additives or sugars; blend with your favorite fruit or almond milk, add a little Glucomannan fiber to make the perfect low calorie, high protein shake. Calculate how much protein your body needs, not enough protein will have you spinning your wheels when working out not achieving any results. Women need more than men! Try to go organic as much as possible, avoid foods (chicken, beef, milk) containing hormones. Avoid pre-packaged deli-meat. Workout with weights at least 3 times per week. Muscle weights more than fat and burns about 4 times the calories as fat. Carbohydrates and proteins each take 2 hours to digest, when mixed you need 4 hours to digest, this does not mean you burned the calories you digested. Balance the food you eat with physical activity to maintain or improve your weight. Try your best to stay away from refined or artificial sugars and enriched foods. Make sure your eating plan consists of plenty of protein, veggies, and fruits. Avoid fast food restaurants, 2 peanut butter & jelly sandwiches is way better than any meal at a fast food place! Switch from "cow milk" to Almond Milk, taste better and its healthier for you. It contains less calories and No Hormones! Lay off coffee and sodas; consider switching to green tea. If you don’t like the taste of tea, but need the caffeine boost www.wholehealth.com sells Green Tea capsules that will satisfy the caffeine need without any calories and they are healthy for you! Like a pool your body also needs to maintain a balanced PH, if your diet has consisted of acid forming foods chances are your PH is on the low side which causes various diseases, you can add PH drops to your water to help balance your body (recommended www.OrizonResearch.com) and/or eat a high alkaline diet. Click here to see the a list of Acid/Alkaline Foods. Desiccated Liver a safe and natural way to pump up muscles without steroid use. Non-synthetic, no risk of Iron poisoning. Excellent for individuals that suffer from iron deficiency, low energy, constant body coldness and dark circles under eyes. Be aware of how many calories you need a day. Education is the best policy in living a healthier life, click here to Calculate Calories needed. For delicious low calories meals check out the Paleo Diet Cookbook your body will never know you are counting calories! And finally when you start working out especially with weights, weight yourself before you begin and then PUT AWAY the scale in a place you cannot see it or get to it easy! Muscle weighs more than fat, so as your are building muscle and replacing the fat with muscle your weight might not fluctuate much, seeing this on the scale might be not be encouraging. It is best to measure yourself and use this as a true guide to how much body fat % your are losing and how much lean muscle you are gaining, linear has a good calculator to help you calculate your figures, recommended to visit prior to starting a workout sessions. Keeping up with our Nutrition is important, after all it is what fuels us and provides us with the energy we need. It is important to make sure we fuel our bodies with the proper nutrition and pay attention to what we put in our bodies, just like you pay attention to what kind of fuel you put into your car, our bodies need that same kind of attention. Below are tips to help you with your fitness goals. Allow yourself a day in the weekend to royally mess it up, in other words trick the body and treat yourself to foods you love. And if you love eating out but can't afford your favorite restaurant, then learn how to cook your favorite meals from famous restaurants with the Restaurant Recipe Book, guarantee that you still will eat less calories than eating out and your pocket won't hurt that much! · Sodium is one factor in the development of high blood pressure. · Sodium is a component of salt; table salt is 40 percent sodium and 60 percent chloride. · Most foods contain some sodium because it is naturally present. · Several food industries are trying to find methods to decrease sodium in the food while ensuring its safety. · The maximum recommended level of sodium intake is 2,300 mg per day. Sodium is a part of everyone's diet, but how much is too much? Under ideal conditions, the minimum sodium requirement is about 1,500 milligrams (mg) of sodium each day. This is less than 1 teaspoon of table salt. The maximum recommended level of sodium intake is 2,300 mg per day. On average, American men consume between 3,100 and 4,700 mg of sodium per day, while women consume between 2,300 and 3,100 mg (due to their lower calorie intake, not because of restricting sodium). To give you an idea of how much Sodium you may be consuming in a day, take the following meal into consideration. In just this one meal you have consumed over HALF of your sodium intake. This is why it is important TO WRITE DOWN what you eat everyday if you are on a weight loss program. Below is a Nutritional Chart from her site to help you get started on watching your calories! BURN 25% MORE CALORIES PER MINUTE WITH KANGOO JUMPS.